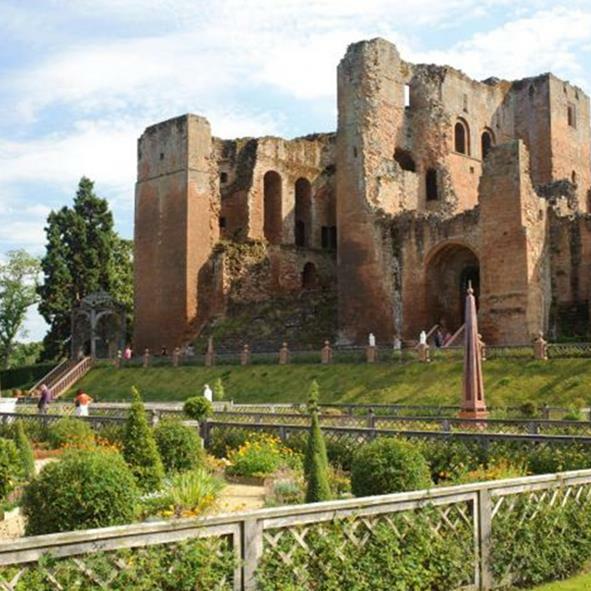 The jagged outline of the remains of Kenilworth Castle calls out to be explored and slowly reveals a historic royal love story to those who make their way around the ruined walls and recreated Elizabethan Garden. Elizabeth I granted the castle to her favourite courtier, Robert Dudley, in 1563. He in turn transformed the castle in order to make it a suitable abode in which to receive the queen and her court, commissioning new luxury private chambers for the queen in the form of Leicester’s Building, as well as a beautiful garden for Elizabeth’s sole use. Dudley spent a fortune on the renovations in the hope that it would help him win the queen’s hand in marriage, and it would appear Elizabeth certainly approved of Dudley’s efforts as she visited Kenilworth several times. She spent 19 days there in 1575 – the longest she ever spent at a courtier’s home. With the castle having fallen into ruin over the centuries, it was, until recently, impossible for visitors to get a sense of what the queen’s private chambers might have been like. However, a newly installed series of stairs and platforms that snake their way up through the shell of Leicester’s Building now afford visitors with the same far-reaching views that Elizabeth would once have enjoyed, and allow people to get an insight into how the queen would have spent her time here. While the castle remains a ruined outline of its former self, Dudley’s spectacular garden has been recreated in full by English Heritage. Along with archaeological research, the gardeners had the help of a detailed letter describing the garden as it appeared in 1575. Fountains, statues, obelisks, arbours and aviaries have all been recreated as described in the letter, and although Elizabeth and Dudley were never wed, the garden now stands as a lasting reminder of Dudley’s labour of love.